President Yahya Jammeh has returned to The Gambia after a reported coup attempt, sources say. Heavy gunfire was heard near the presidential palace in Banjul on December 30 but officials say the military takeover was thwarted. Details remain sketchy but Yahya Jammeh, 49, said there had been an attempted invasion from neighboring Senegal. 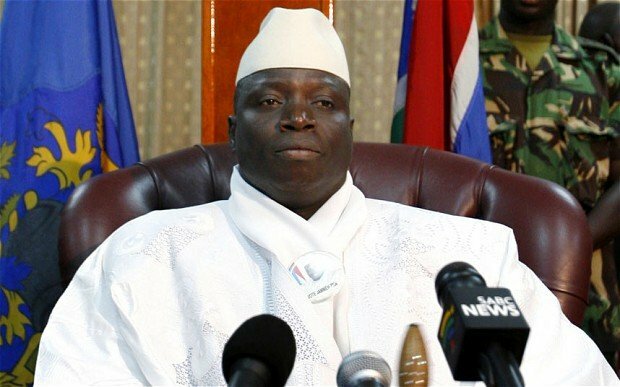 Yayha Jammeh seized power in Gambia in 1994, and is accused of not tolerating any opposition. A pro-opposition radio station says most businesses are closed, while the market in the biggest town, Serekunda, is deserted. The pro-opposition Freedom newspaper reports that four people were killed, including the alleged ringleader Lamin Sanneh, a former head of the presidential guards, but this has not been confirmed. Yahya Jammeh was said to have been in either France or Dubai during Tuesday’s unrest but different sources agree he has now returned. Yahya Jammeh has won several elections since seizing power but critics say they were neither free nor fair. Numerous officials and opposition leaders have fled the country, saying they fear for their lives. Apart from a short Atlantic coast, The Gambia is entirely surrounded by Senegal. The Gambia’s main foreign currency earners are tourism and peanut exports.